Posted on September 2, 2009 by Notorious B.U.D. King Felix showed no signs of slowing down in August. Is a Cy Young next? Top Hitter: Jose Lopez had a solid month of production at the dish (.258-6 HR-22 RBIs-10 2B) and Mike Sweeney took advantage of increased playing time (.333-2 HR-9 RBI-5 2B) but the best hitter on the team continues to be Mr. Consistency, Ichiro Suzuki. Despite missing 7 games with a calf injury, Ichiro hit his usual .340 with 2 HRs and 10 RBIs, in addition to swiping 3 bags and scoring 16 runs. Seattle’s offense went into a major funk without him at the top of the lineup and they were glad to welcome him back to the field last night. Suzuki is just 14 hits away from becoming the first player in major league history with 9 straight 200+ hit seasons and is also just 9 hits away from 2,000 in his MLB career. Yeah, he’s that good. Top Pitcher(s): Felix Hernandez continued his breakout season with a sterling August that put him good position to make a run at the AL Cy Young Award (his teammates didn’t help the cause though, getting 1-hit by Zack Grienke). The flame-throwing right hander went 2-1 in the month with 2.70 ERA and 40 Ks in 40 innings. On the season, the 23-year-old Hernandez is 13-5 with a 2.77 ERA and 179 Ks in 185 innings, a vast improvement in all statistical areas from last year. Felix starts have become must-see TV, and Seattle has to begin worrying about whether he will stick around when he becomes a free-agent in two years. Translation: enjoy him while you can. Langerhans doesn't go deep often, but when he does...game over. Biggest Surprise: Despite the fact that he’s hitting .211 on the season, Ryan Langerhans has provided Mariners’ fans with plenty of excitement. The soft-hitting lefty has drilled only 3 HRs on the season, but 2 of them are of the walk-off variety and both came in August (7th and 25th). An amazing 10-percent of his hits this season have been walk-off HRs, which becomes much less amazing when you consider Langerhans only has 20 hits on the year. At least he’s making them count. Biggest Disappointment: Erik Bedard was shut down for the season on August 20th, adding further disappointment to his short tenure in Seattle. Bedard wasn’t bad when he pitched (5-3, 2.82 ERA in ’09) but rarely went deep into ballgames and struggled with injuries both seasons. With the continued growth of the players the M’s sent to Baltimore to acquire Bedard (Adam Jones, Chris Tillman, George Sherrill) this might go down as one of the worst trades in recent history (though not quite as bad as the Bartolo Colon for Grady Sizemore, Brandon Phillips and Cliff Lee deal). Griffey Watch: Junior had his best month of the season in August, hitting .246 with 4 HRs and 13 RBIs, which was highlighted by a pinch-hit walk-off single against the Chicago White Sox in the 14th inning of a thrilling 1-0 Seattle win. Griffey missed a couple of games at the end of the month with sore knees but is expected back in the lineup soon, and though Seattle is out of contention, should give fans a reason to attend M’s games during the last 5 weeks of the year. This may be your last chance to see one of the greatest ball players of all-time (currently sitting on 625 career HRs), so soak in his every at-bat, players like Griffey come along once in a generation. Rookie Doug Fister has been a welcome addition to the M's. Injuries: Endy Chavez (torn ACL–out for year); Russell Branyan (herniated disk in back–mid-September return, possibly out for season); Adrian Beltre (bruised testicle–should return September 1); Ichiro Suzuki (tight left calf–should return September 1); Carlos Silva (rotater cuff–set to begin rehab assignment, unfortunately); Erik Bedard (shoulder surgery–out for season). Welcome Aboard: Doug Fister was called up from Triple-A Tacoma and did nothing but impress in his 5 August outings, going 1-1 with a 3.42 ERA and 18 Ks against 7 BBs. The 25-year-old is making a strong case to be a part of the Mariners rotation in 2010, and twirled a gem against the Angels last night (7.1 innings, 5 hits, 1 R). Fister takes a pitch-to-contact approach on the mound (2 walks or less in 4 of his 5 starts), relying on the M’s defense and the spacious confines of Safeco Field to keep hitters in check. So far, it’s worked. Overall Grade: (B) The Mariners continue to hang around on the outskirts of the playoff picture and finished August with a winning record (15-14). Sure they aren’t the best team in the league, but this is a far cry from last year, and they are building some excitement towards the 2010 season. 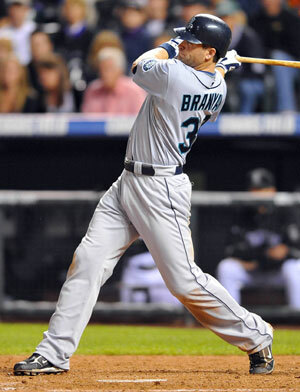 September should be a fun month, with expanded rosters giving fans a look at M’s of the future. Posted on July 25, 2009 by Notorious B.U.D. Matt Holliday has gone 6 for 9 in his first two games with the Cardinals. In a move that they hope will propel them to a second World Series title in four years, the St. Louis Cardinals acquired coveted slugger Matt Holliday from the Oakland Athletics in exchange for three minor league prospects. St. Louis had been rumored as a destination for Toronto’s star hurler Roy Halladay, but the team decided getting a proven hitter like Holliday to follow Albert Pujols in their lineup was a more pressing need in their playoff push. Despite a subpar supporting cast around Pujols the Cardinals still find themselves leading the NL Central by 1/2 game over the Chicago Cubs. Playing in one of baseball’s most competitive divisions, (the NL Central boasts four teams with records over .500) St. Louis’ addition of Holliday should make them the favorite to capture the Central. 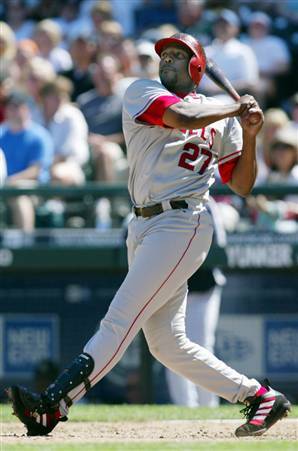 At the time of the trade, 2007’s MVP runner-up was hitting .286 with 10 HRs, 54 RBIs and 12 SBs for the last place A’s. Holliday landed in Oakland during the off-season in a trade from the Colorado Rockies, a surprising move given Billy Beane’s track record for shying away from veterans with big contracts. Holliday struggled early in Oakland and the team quickly fell out of contention in the AL West. It wasn’t long before his name started to come up in baseball circles as a perfect complement to Pujols in the Cardinals’ lineup. St. Louis manager Tony LaRussa has long been a fan of Holliday from his days in Colorado, and the Red Birds were in desperate need of some offensive firepower to support their stellar pitching staff (3.72 team ERA ranks 3rd in NL). Holliday offers a rare blend of speed and power and the Cardinals hope their new slugger will make teams pay for pitching around Pujols who leads the league with 75 walks. Holliday will man leftfield opposite Ryan Ludwick, who continues to heat up after a slow start (.392-5 HR-24 RBI in July), forming a potent heart of the heart with Pujols. While this move makes the Cardinals the most talented team on paper in the NL Central, the Dodgers still remain the team to beat in the National League. 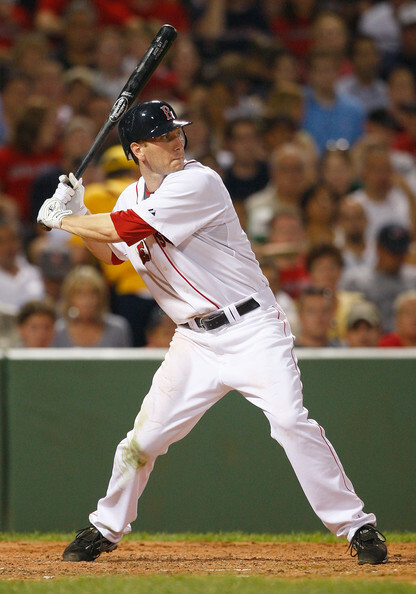 Oakland hopes new addition Brett Wallace can become a mainstay in their lineup as soon as 2010. On the flip side of the deal, the constantly rebuilding Athletics acquire one of the best third-base prospects in baseball, 22-year-old Brett Wallace. The left-handed slugger out of Arizona State was the 13th overall pick in last year’s draft and had already reached Triple-A in the Cardinals organization. Wallace makes good contact at the plate, has plus-power for a corner infielder and hits left-handed pitching well. He is a below-average defensive third baseman and may be shifted to first base or DH, but his bat should have him playing full-time in Oakland by next season. The A’s also acquired Shane Peterson, a likely 4th outfielder in the majors unless he improves his plate discipline, and right-hander Clayton Mortenson, a groundball pitcher who projects as a fourth or fifth starter. On the surface it appears that Oakland received a better haul of prospects than they gave up for Holliday, and the move probably saved the team a bundle of money. Holliday is eligible for free agency at the end of the season, and if Oakland had offered him arbitration and he accepted, it would have cost them in the neighborhood of $17-18 million. However, if they declined to offer Holliday arbitration they would not have recieved two first-round compensatory picks in the 2010 draft, leaving Billy Beane little choice but to deal the slugger. As always, the A’s keen GM made the best of the situation, stockpiling the Oakland farm system with talented young players who could make an impact as early as next season. Baseball’s first big trade of 2009 should set off a domino effect as teams in both leagues to seek to keep pace with St. Louis’ acquisition of Matt Holliday. The move puts pressure on the Phillies to up their offer for Roy Halladay and the Cubs almost certainly need to do something if they want to recapture the NL Central crown. The most nerve-wracking week in baseball just got more interesting, as the Cardinals take a major step forward, and the trade deadline continues to bear down on general managers with each passing minute.